Home / Blog / The ‘Blooming Green Earth’ is on fire – literally! Next week, EIA will participate on a panel at a major conference of consumer goods and commodities companies and NGOs, focused on how to work together to achieve zero-deforestation in their commodity supply chains. The conference is an important event and will be attended by a host of global companies seeking to implement zero-deforestation policies in their production or procurement of commodities such as palm oil and timber, pulp and paper, rubber, soya and beef. High on the list of those attending is Asia Pulp and Paper (APP), Indonesia’s biggest pulp and paper producer, which is currently implementing a progressive Forest Conservation Policy (FCP) developed with the consultancy The Forest Trust (TFT) in response to effective markets campaigning by Greenpeace. The policy – which also applies to third party suppliers – requires zero deforestation, the avoidance of fibre produced on peatland containing more than 35 tonnes of carbon per hectare, legal compliance with Indonesia’s timber laws and a range of other commitments. APP’s policy is a game-changer, bringing a long-overdue breathe of sanity to what have been the most insanely deforesting sectors in Indonesia. APP’s plans are now almost universally held up as a standard for other forestry companies to aspire to and have transformed the company’s brand image from environmental pariah to leading conservation visionary. So, why has one of APP’s main pulpwood suppliers been on fire, in breach of Indonesian law, since August? 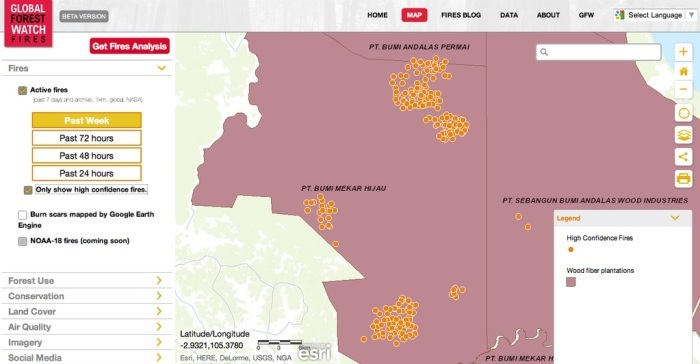 A brief glance at WRI’s Global Forest Watch fire monitoring web platform details 214 fire hotspots as having been identified in the main industrial timber plantation (HTI) of PT Bumi Mekar Hijau (PT BMH) between October 7-14 alone. A further 14 fires were identified in smaller BMH concessions nearby. Bumi Mekar Hijau translates literally as “Blooming Green Earth” but it’s unlikely its burnt concession areas are blooming or green right now; scorched earth seems more apt. WRI analysis indicates that the fires in BMH catapulted Ogan Komering Ilir district of south Sumatra province to the top of the fires list on Sumatra island, with 259 having been identified – nearly all in BMH concessions; 70 per cent of hotspots detected across Sumatra island and Peninsular Malaysia during the period have occurred inside pulpwood concessions and 71 per cent on peatland, due almost exclusively to the fires observed in BMH. Ironically, BMH was reported to be working hand-in-glove with district- and provincial-level government, police and military officials to prevent such fires as part of a dedicated fires Task Force in late September. This followed a staggering 364 fire hotspots being detected in BMH’s concession between August and September 15. Not allowing them to be set on fire could be a viable short- and long-term solution to start with. Last year, BMH was found to have breached APP’s forest conservation policy by clearing land that should have been set aside under the policy, and in 2011 BMH’s concession was judged to be “bad” in implementing Indonesia’s “Sustainable Production forest Management” standard and was not issued a certificate. Things still seem pretty bad if the fire data is anything to go by. Burning land is illegal in Indonesia but nevertheless commonplace due to enforcement deficiencies and the economic gains to be made. Such burning drives the devastating seasonal haze that blights Indonesia and neighbouring Singapore, Malaysia and Brunei, resulting in diplomatic spats. 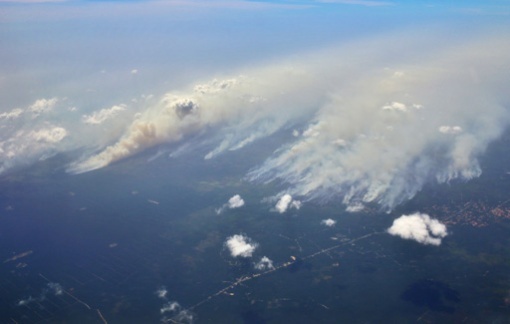 Hundreds of flights are cancelled, schools closed, and thousands of citizens report to hospitals with breathing difficulties because of illegal land preparation by fire on Indonesia’s Sumatra and Kalimantan islands. That’s not to mention the climate impacts – illegal land-burning is a key reason Indonesia is the third biggest carbon emitter worldwide. The fires in BMH this month are a timely reminder to APP, the Indonesian and neighbouring governments, and the participants at the coming deforestation conference that policy is one thing and implementation is another. It’s great that big companies are seeking to go beyond legal requirements to make commodities production less environmentally and socially destructive, and deforestation free. EIA is broadly hopeful that such emerging corporate policies can drag commodities production out of the middle ages and set a new baseline for the reform of government polices on land use and spatial planning over the coming years that can be supported by reciprocal legislation and other demand-side measures in consumer countries. But in a sector and country where meeting basic legal requirements still appears beyond reach, monitoring and enforcement are crucial to stop progressive sustainability initiatives going up in smoke before they are really off the ground. So what is the message for responsible paper buyers thinking of re-engaging APP as a supplier? According to one of the organisers of next week’s deforestation conference, who has closely monitored the APP story, “customers wishing to resume trade with APP must link contracts and procurement to continued delivery of the forest conservation policy”. This sounds sensible. With BMH set to be one of the main pulpwood suppliers to APP’s new two-million-tonnes-a-year pulp mill in Ogan Komering Ilir, prospective customers of APP would be well advised to robustly monitor how its ‘no-burn policy’ (well, it’s actually the law) is being implemented – or not – in supplier concessions such as BMH. APP has a comprehensive fire management system, but it seems it may have failed about 578 times in BMH since the beginning of August – an average of seven times a day. • Click here for Global Forest Watch Fire analysis for Sumatra for October 7-14, 2014, detailing distribution of fires and disclosing that PT Bumi Mekar Hijau featured 214 fires.